Our Eclipse Towel line is a value line of slightly irregular towels. These are collected from high end towel mills around the globe. Savings on these will vary from 20-40% of first quality equivalents. We have strong relationships with the largest and best towel mills in the world. We purchase all these items on an “open order” basis. This gives us purchasing power to bring value-driven items directly to our customers. Eclipse Carton Packed Towels - Slight imperfects from Shuttleless towels. These are high-quality ring spun products made for national hotel chains. Eclipse Bale Packed Towels - These towels are the same quality as the carton packed Eclipse Towels but will be compressed for more cost effective shipments in bulk. 16 Single Open-End Towel Bales - Made for midlevel institutional customers. These towels are softer than our economy line. They will need to be washed prior to use. 10 Single Open-End Towel Bales - If you need a basic towel for institutional use, this is it. 100% cotton 10S yarn, packed in bales. 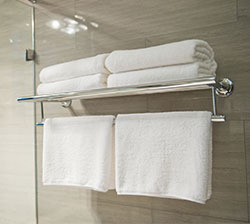 B-Grade Shop Towels - Most shop towels are used only a handful of times. Our slightly imperfect shop towels are perfect for a “wipe and toss” environment. 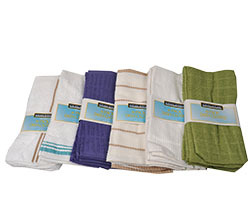 Value Bar Mops & Kitchen Towels - Most bar towels last 4-5 cycles. These towels are slightly imperfect and will contain minor mistakes.